So the inventory leg of our three-legged stool is short. It has basically been sawed down to one quarter of its typical length. As a result, our stool, and our market, is wildly out of balance. Spring has arrived three weeks early and this means plants along Colorado's Front Range are blooming ahead of schedule, especially the bulbs we planted last fall. Tulips and daffodils in a lightly mulched bed may be as tall now as they normally would be on April 8th. 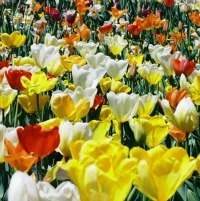 Bulbs located in a sunny south facing bed against a house or wall may be already be in full bloom. Despite an early spring, if your daffodils are in full bloom and temps fall below freezing, those blooms will probably freeze. You cannot protect those flowers, but if you would like to slow down growth of bulbs as they are emerging, you might be able to do just that. The process begins by testing the soil temperature. If your tulips and daffodils are now breaking through the soil surface, do a test using the meat thermometer from your kitchen. A compost thermometer also works. Brush away the mulch around emerging bulb plants and push the point of the thermometer down as far as it will go into the soil. If the reading is below 60 degrees, then you should be able keep the soil cool and slow the development of these emerging plants. The process ends by adding more mulch to the bed. Additional mulch shades and insulates the soil to keep it from warming in the sun. Keeping the soil cool will slow down growth of the plants and delay bloom time. If the reading is above 60 degrees and plant growth is taking off, you probably can't slow down the plants because the soil is warm and activating growth. These plants, however, could probably use a splash of water. Give them enough water to moisten the soil to about 1" below the surface. Word of caution: be careful not to over water bulb beds. Over-watering can make bulbs mushy. If you watered the bed in when you planted, bulbs won't need much more than a sprinkle. And if they're on the east or north side of a structure, test the soil with your hand. If it crumbles like sand, it's time to add water. Advice for perennials. With the warmth and winds, perennials could use a good, healthy drink of water. They rely on soil moisture along with more hours of sunlight and warmer soil temperatures to wake up and grow in the spring. We have warming soil, more hours of sunlight and now they need that third and most important ingredient - water - to stay alive and healthy for the upcoming season. Give them a good drink.